Independence Day, 2015. The day Don and I returned to the scene of the crime. The offense? Visiting a National Treasure without Robb. This Fourth of July we were to serve the term of our punishment. 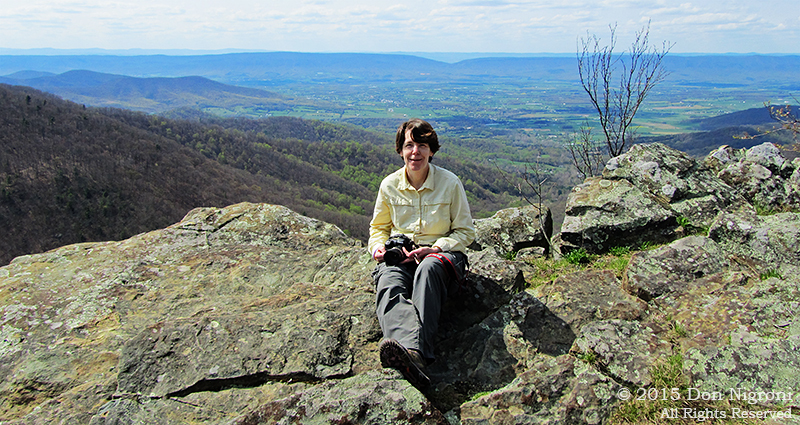 Three months after we left Shenandoah National Park, we returned for a weekend, this time with Robb in tow. 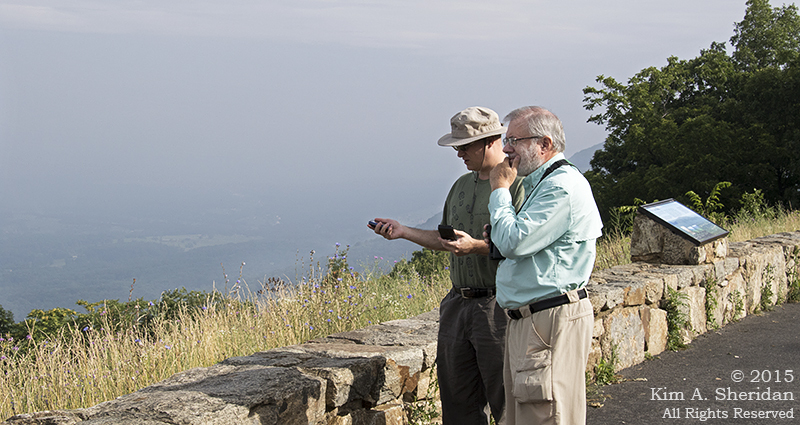 A chance for Don and I to introduce him to the wonders of Skyline Drive. What a change in the landscape! 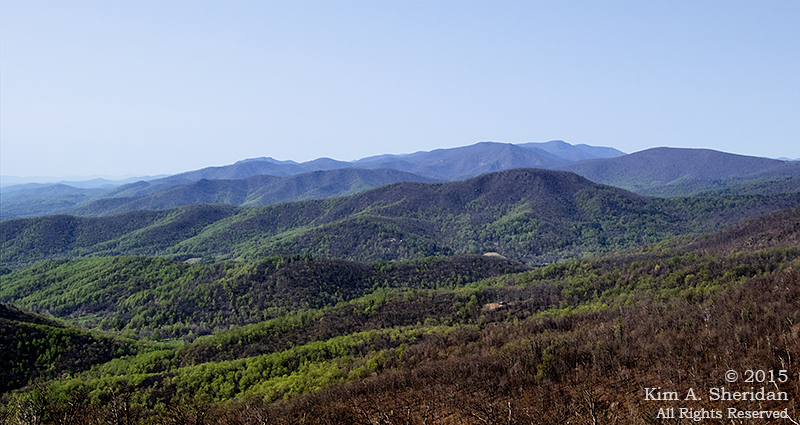 When we left in April, the mountainsides were mostly brown with tinges of the lime green of new spring growth. Now all is lush dark green. 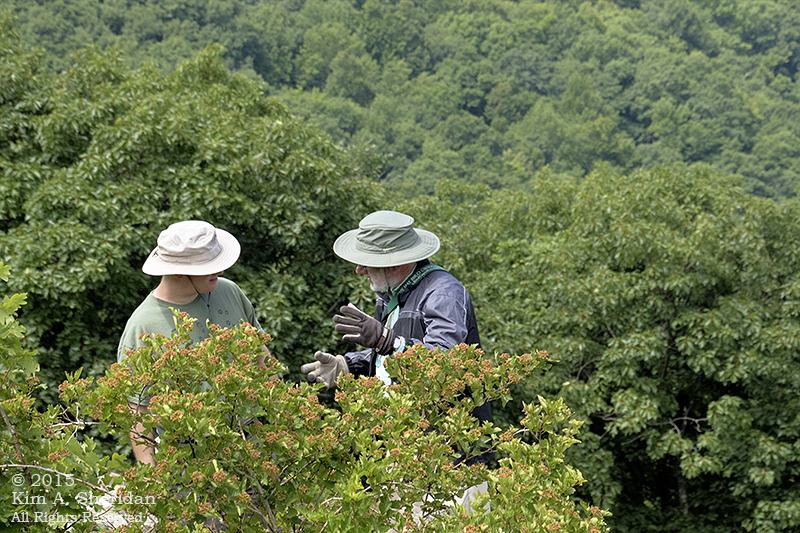 With plans to hike to up The Massanutten toward Signal Knob the next day, Robb and Don took the opportunity to take a compass heading and puzzle over the proper approach. 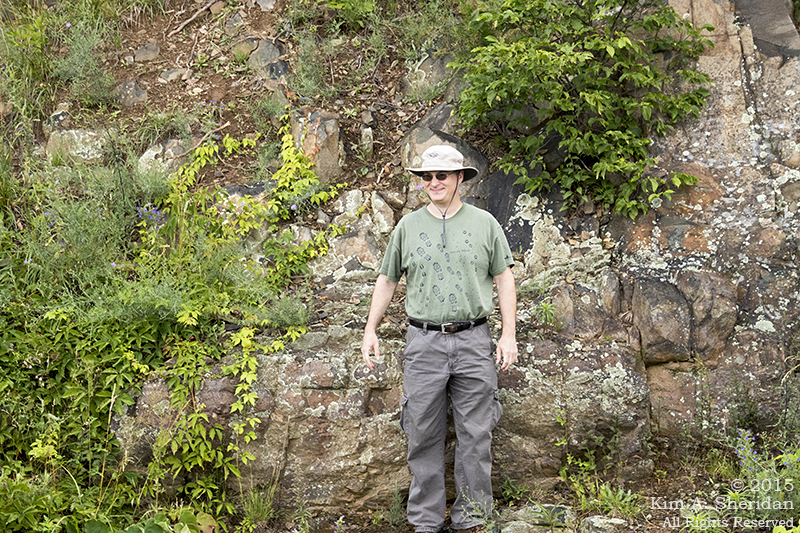 Robb on one of the rock faces that line parts of the east side of Skyline Drive. Now who’s doing the hard time? With all these vast mountain vistas and valley views in a new environment, what’s Robb looking at? Plants, of course. 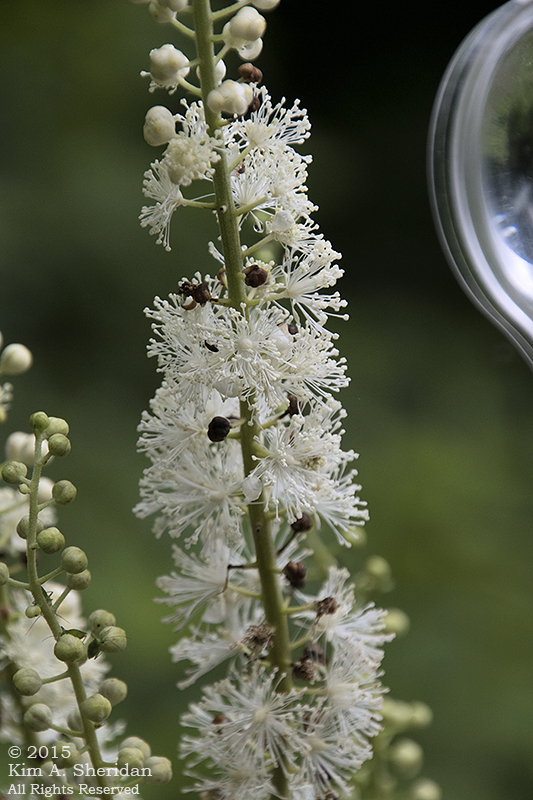 There’s this one spiky flower we kept seeing along the roadsides as we were driving. We couldn’t identify it on the move, but it was never present at the overlooks. Finally Robb and I walked back along the road to take a closer look. 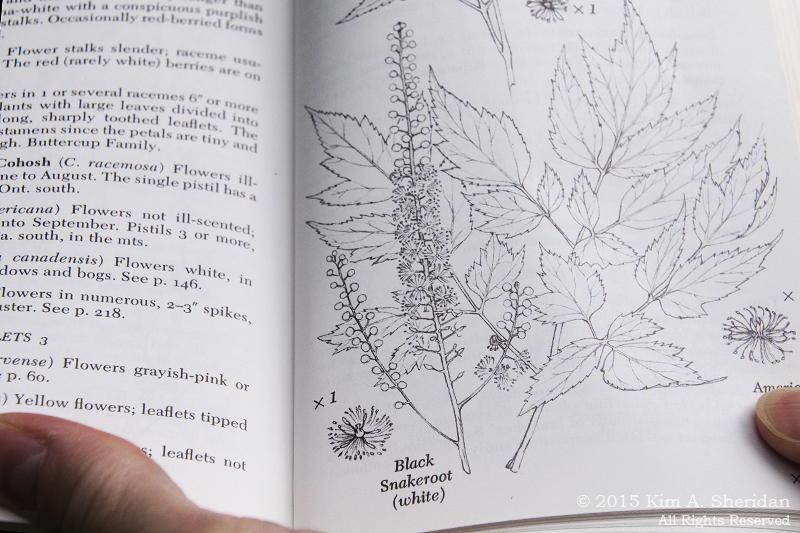 Armed with a hand lens and Newcomb’s Wildflower Guide, we were able to identify it as Cimicifuga racemes, commonly called Black Snakeroot or Black Cohosh. Mystery solved! A tree and granite vignette. Headlights appear from the mist. 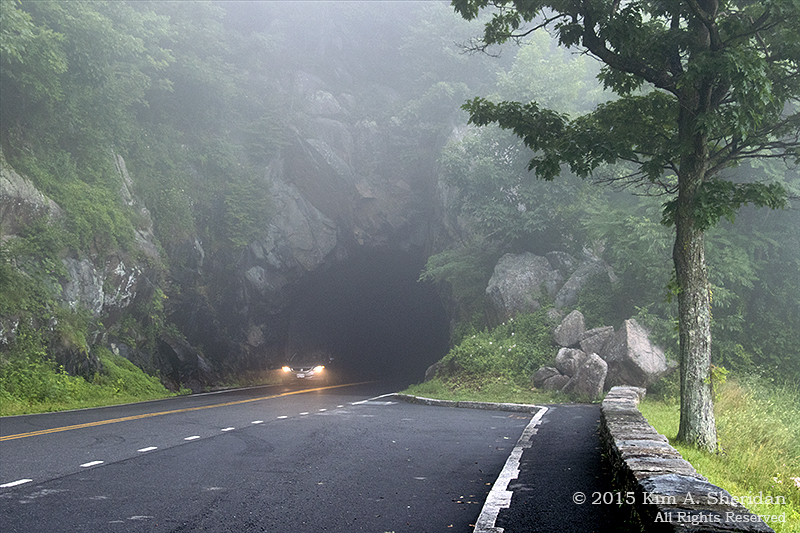 Shenandoah’s only tunnel bores 670 feet through the granite of Marys Rock. 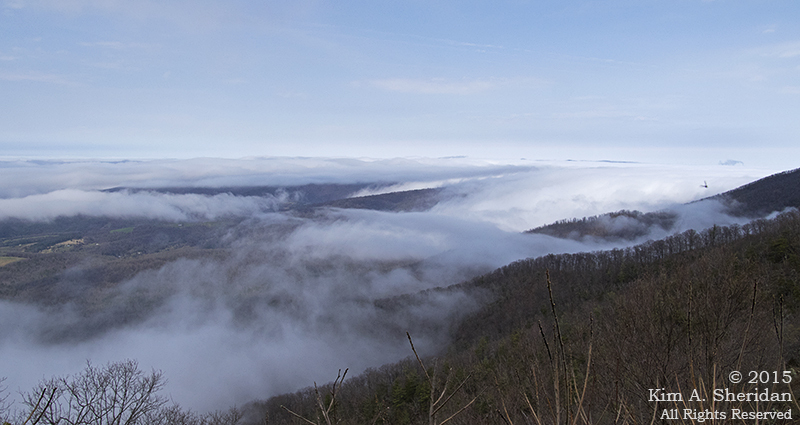 Fog along the Skyline Drive. How – familiar. Franklin Cliffs never ceases to delight. I could spend the whole day here, clambering around on the rocks. Who says crime doesn’t pay? Man vs. mountain. From the looks of it, the mountain won. Always an argument with these two. 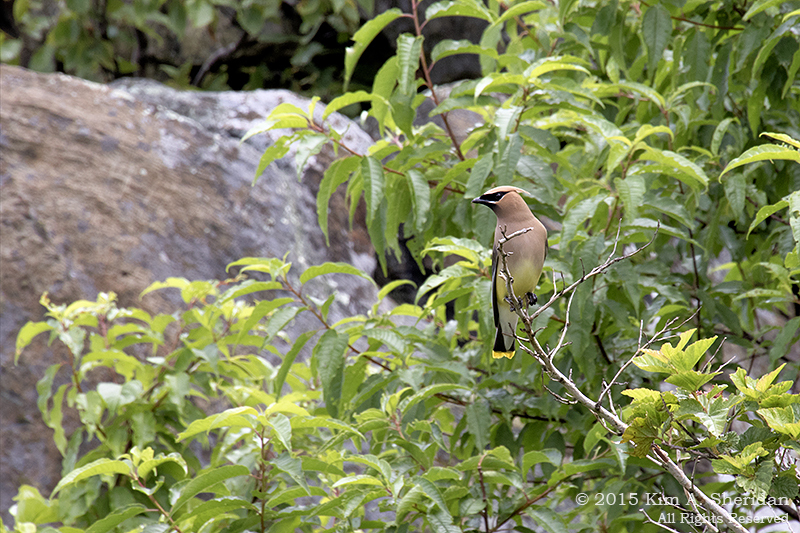 Cedar Waxwing, wearing a robber’s mask. Robb and I had wanted to walk to a waterfall. Small problem – the crowds. It was the Fourth of July in one of America’s most popular National Parks, after all. 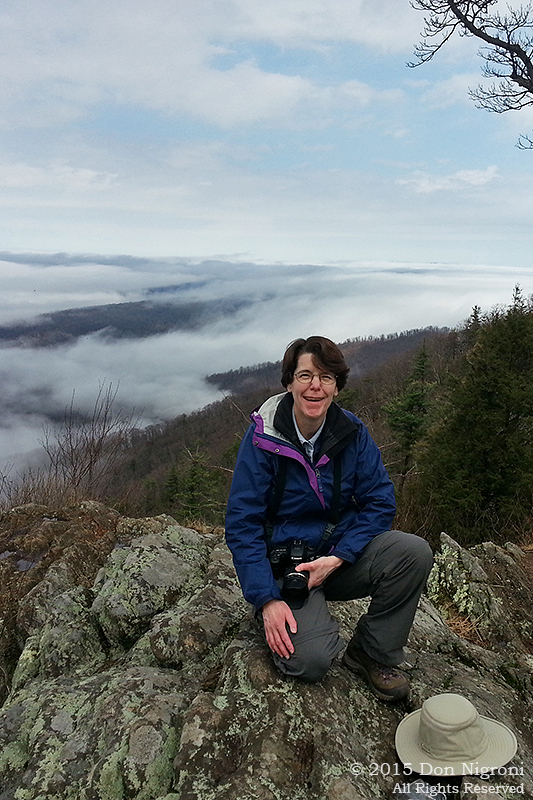 We opted instead to take the hike to the top of Stony Man, knowing Robb would love scrambling around on the boulders. Except that those boulders were covered with people. 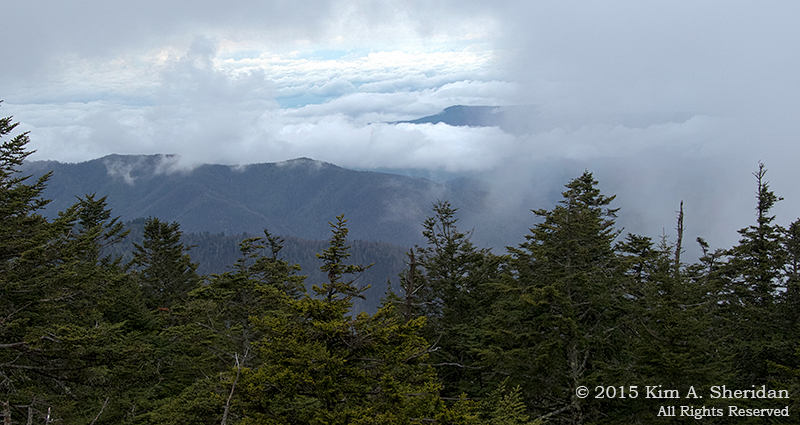 On the horizon, ominous dark clouds were quickly swallowing the views. And as we turned to leave, the skies opened up. Oh great. Thunder and lightning. 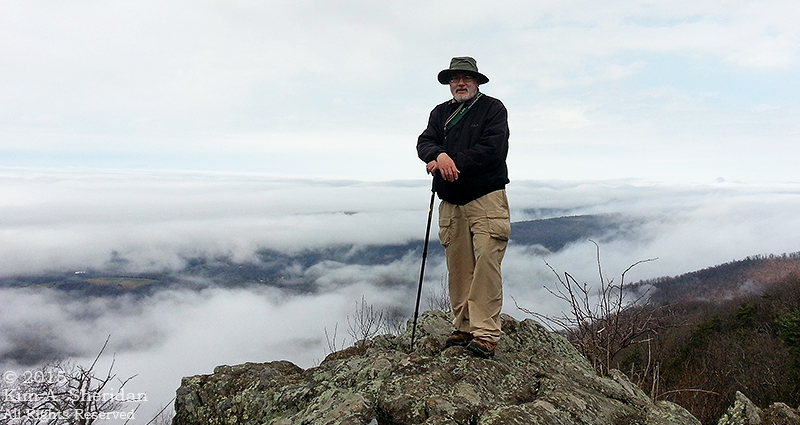 And there were Don and I on the second highest peak in Shenandoah, clutching metal trekking poles. Cruel and unusual punishment. 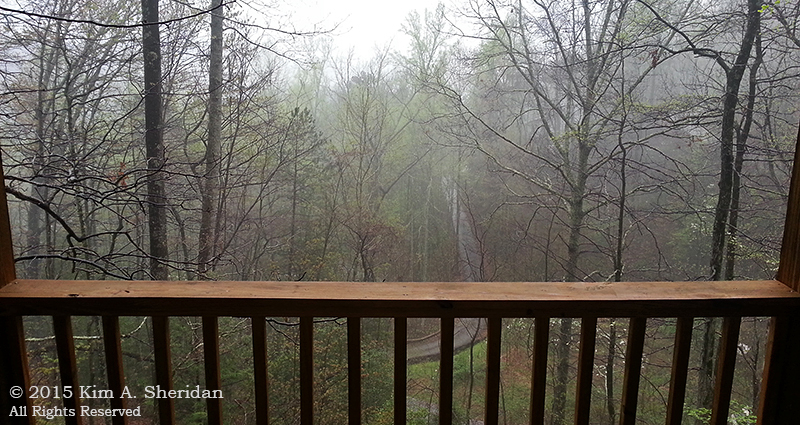 The rain was relentless, and we were walking downhill in a rushing streambed that used to be a trail. Oddly, I was thoroughly enjoying it. I’d not been feeling well that day, but the rain was cooling and rejuvenating. Even when I had to pour it out of my “waterproof” boots at trail’s end. As we reached our car, the rains stopped. But of course. 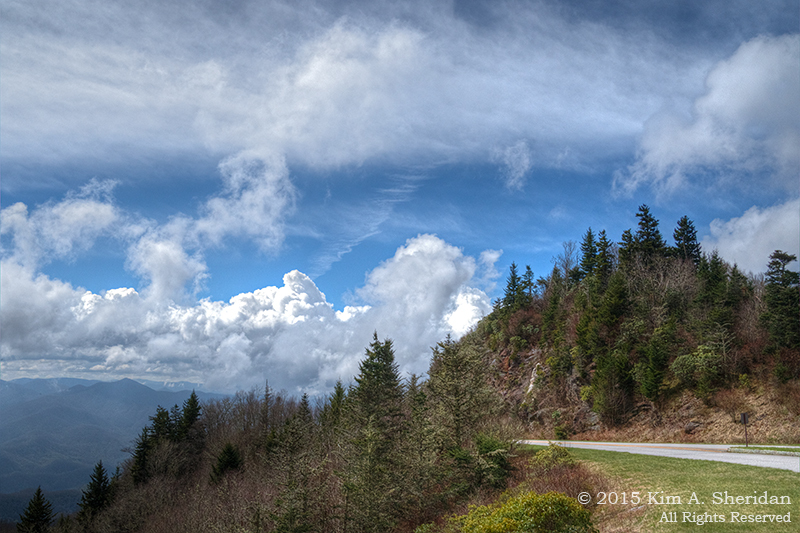 By the time we returned to Skyland Resort for a brief stop, the skies were clearing and the sun was coming out. The mountain air had a delicious washed-clean feel to it. Later, in a nondescript hotel room, a different kind of washing took place. Don used a hair dryer on his cash, blowing dry each individual paper bill. Money laundering at its most elemental. 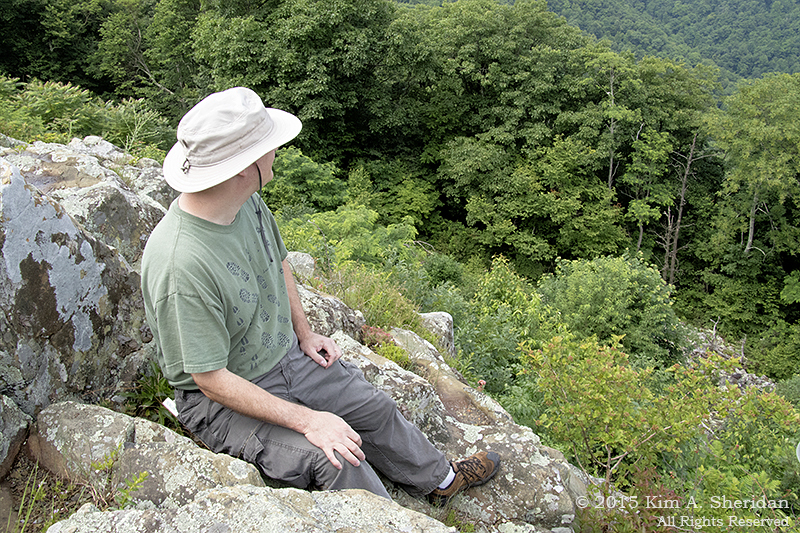 Robb relishing the view from Franklin Cliffs, while Don and I served out our sentence for neglecting him, with no time off for good behavior. 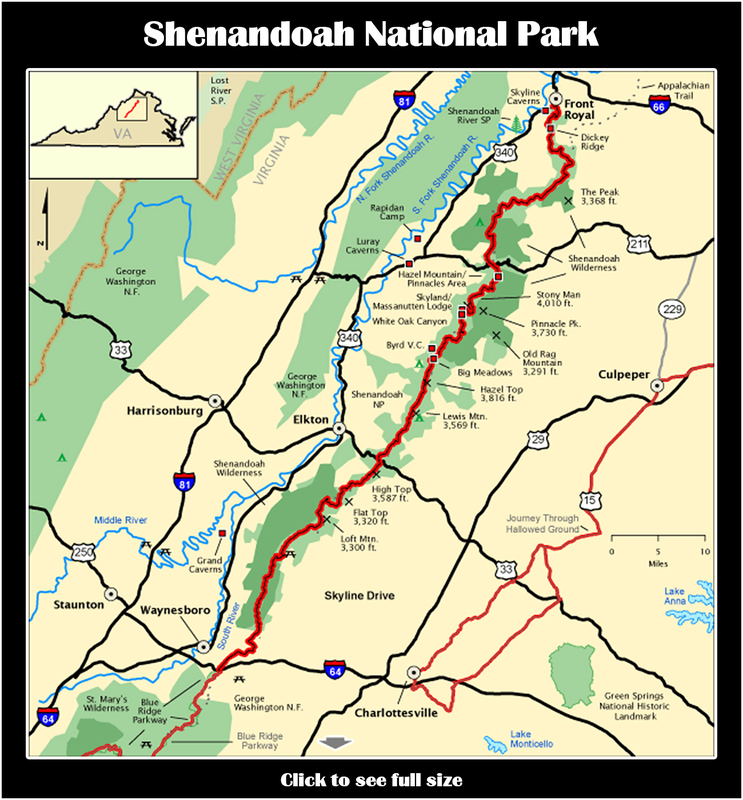 If spending a day in Shenandoah National Park is “punishment”, I’m going to have to be very, very naughty. 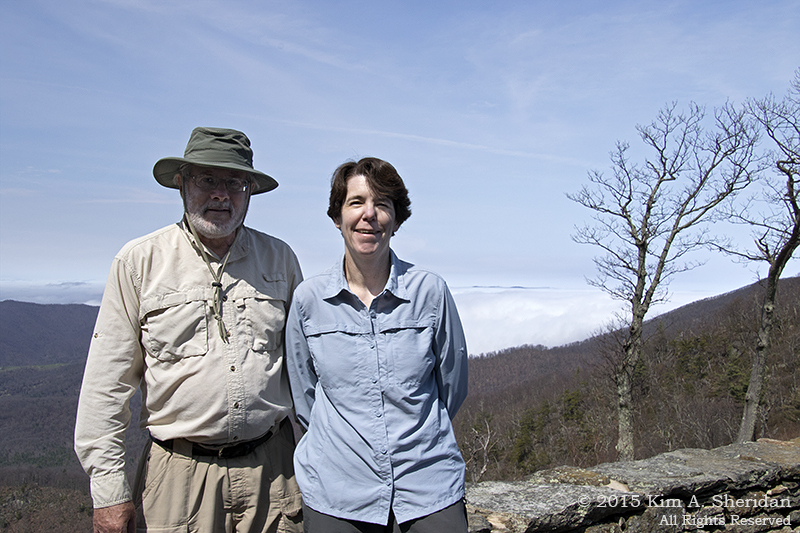 On the last two days of our two-week sojourn through the southern Appalachian Mountains, Don and I returned to Shenandoah National Park. By now we were wiser, and more experienced in the ways of the mountains. 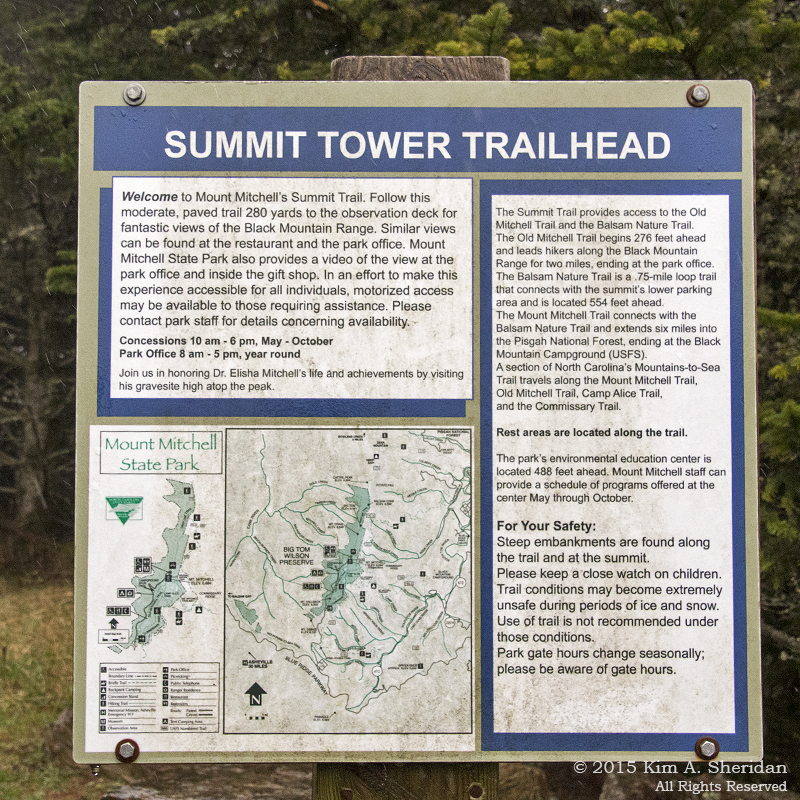 This time we planned to drive the length of Skyline Drive from south to north, spending a night at Skyland Resort in the Park, and hopefully getting a little hiking in. We found spring a little more advanced since 11 days before. More trees and shrubs had covered their bare brown branches with bright green spring coats. Flowers and trees put out blooms that nicely framed the mountain and valley views. 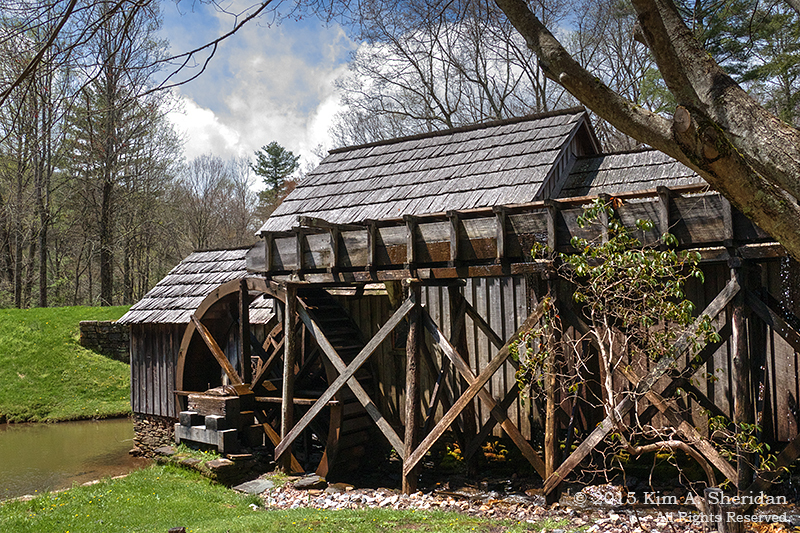 Best of all, we had blue skies and white fluffy clouds – and no fog! Don was fascinated with a mountain called The Massanutten (yes, it’s called that, and yes, he insists “The” be capitalized.) 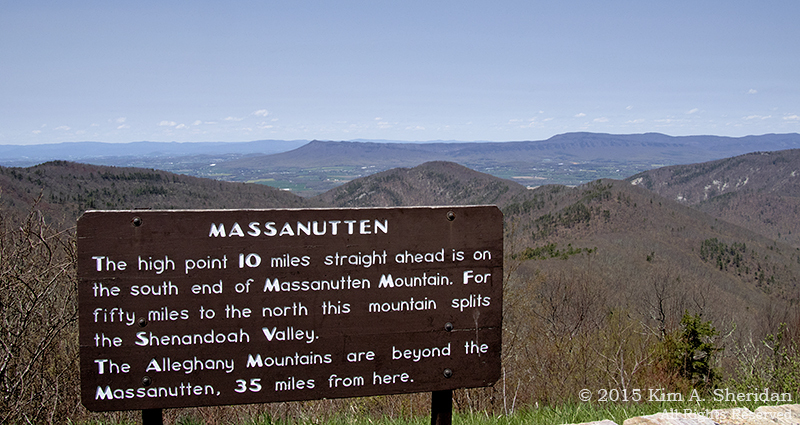 The Massanutten runs 50 miles down the heart of the Shenandoah Valley. Why is there a mountain in the middle of the valley? 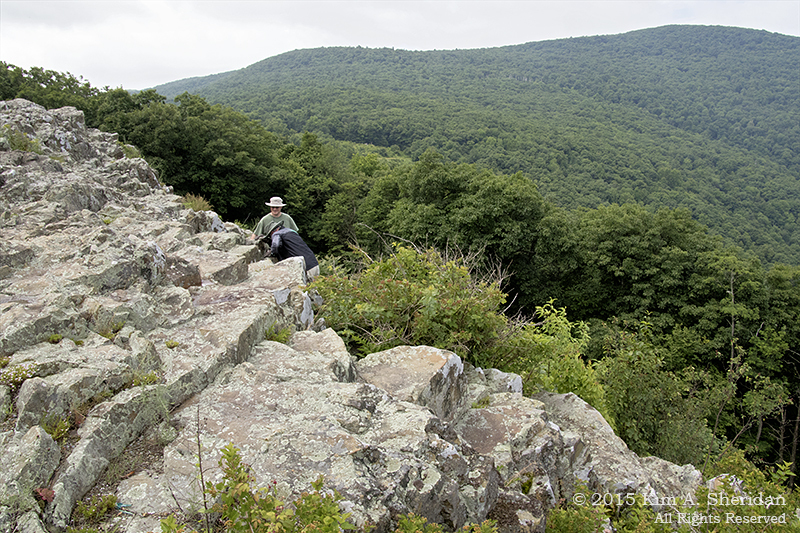 As the valley gradually eroded away, the harder Massanutten Sandstone that forms the ridge remained. 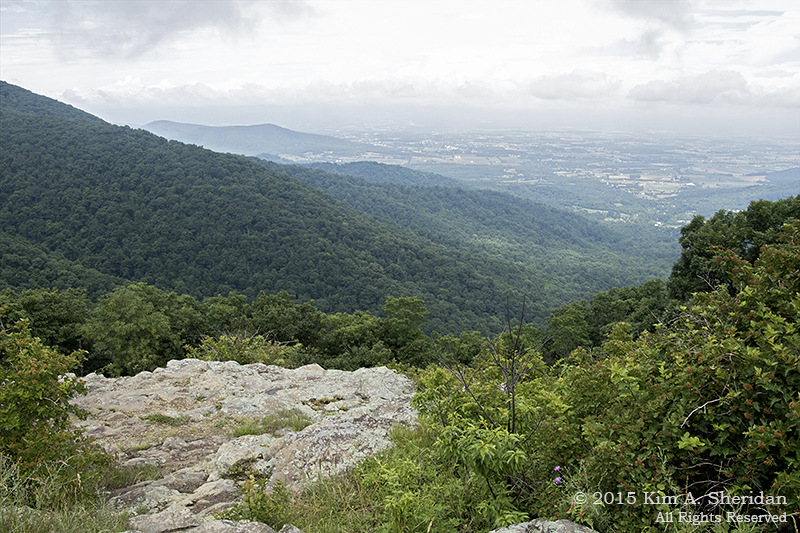 It makes for spectacular viewing from all along Skyline Drive. This is the southern end. 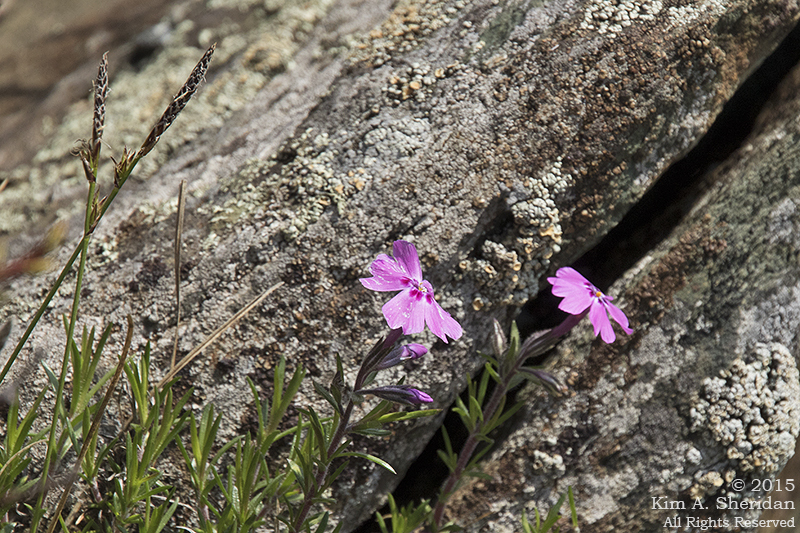 Mountain pinks on the mountainside. Old Rag looks like fun to scramble around on. 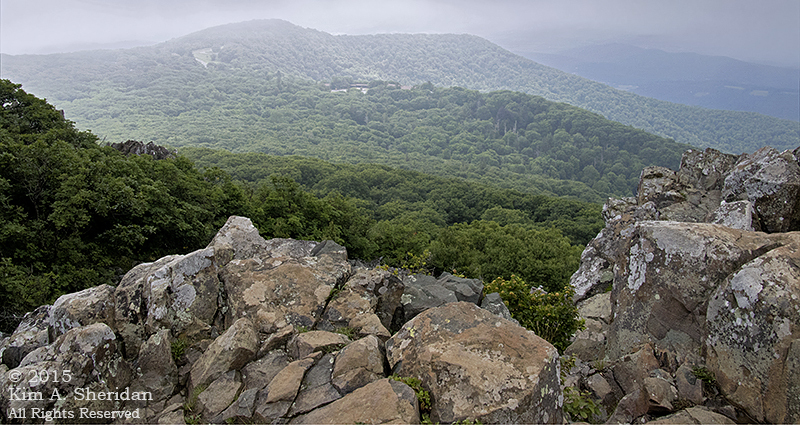 Peaks like Old Rag exist because the rock they are made of is extremely resistant to the weathering that eroded the softer rock around them. 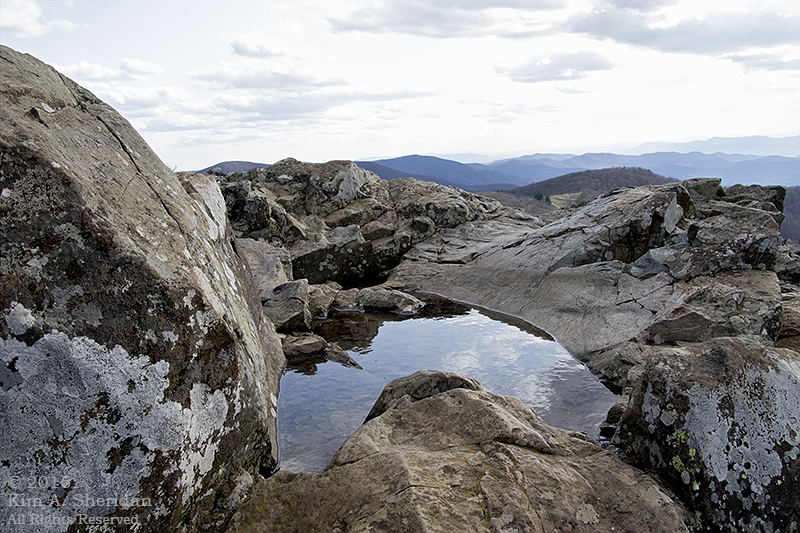 The rock that makes up Old Rag is called – wait for it – Old Rag granite. We took a walk at the end of the day on the Stony Man Trail. 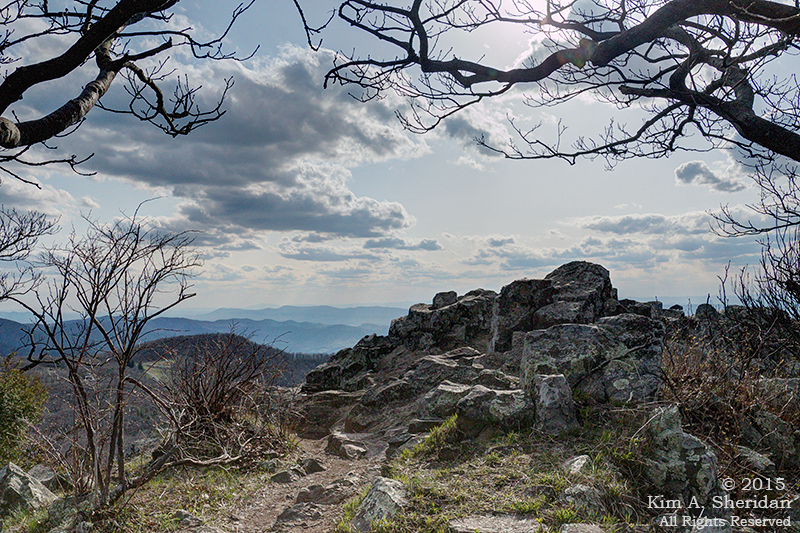 It’s a 1 ½ mile path to the peak of Stony Man Mountain, which at 4011’ is the second highest peak in Shenandoah NP. 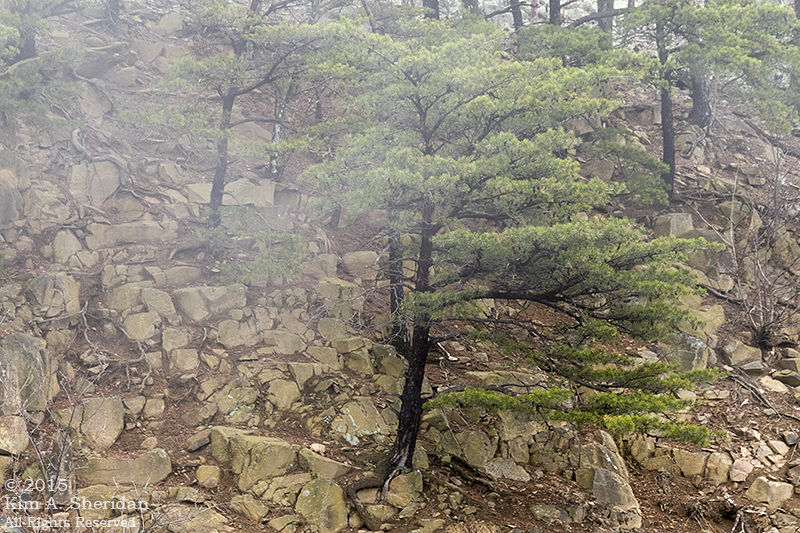 Near the peak, red spruce and balsam fir grow, remnants of a colder climate. 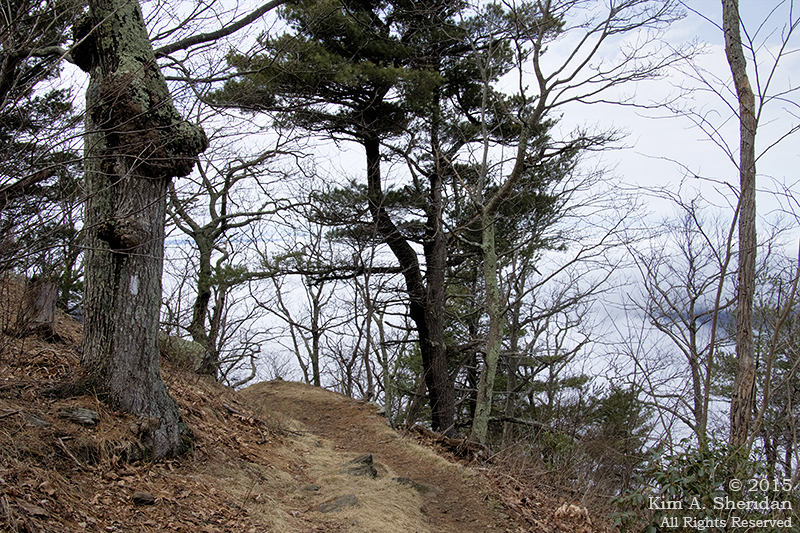 The trail wound around fascinating boulders before coming out of the woods onto the top of the rock outcropping that forms Stony Man’s profile. Sky reflection in a boulder puddle. Don and I had a blast scrambling all over the rocks here. 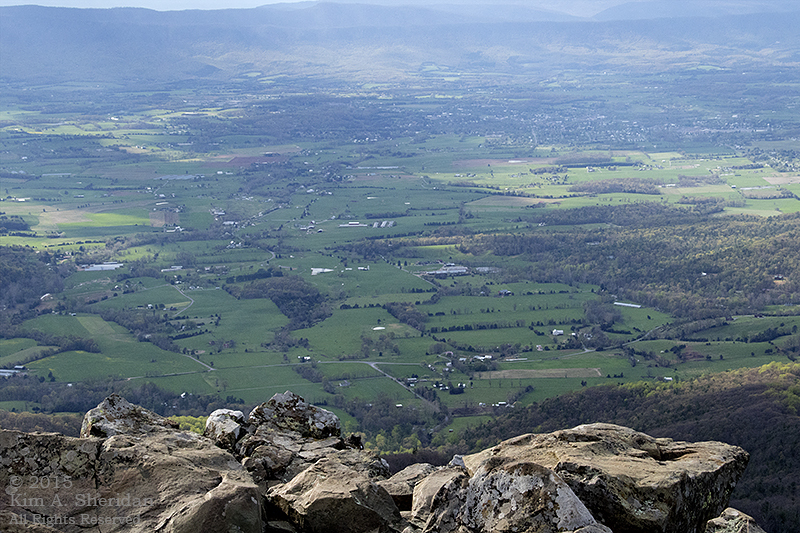 Looking into the valley from Stony Man’s forehead. 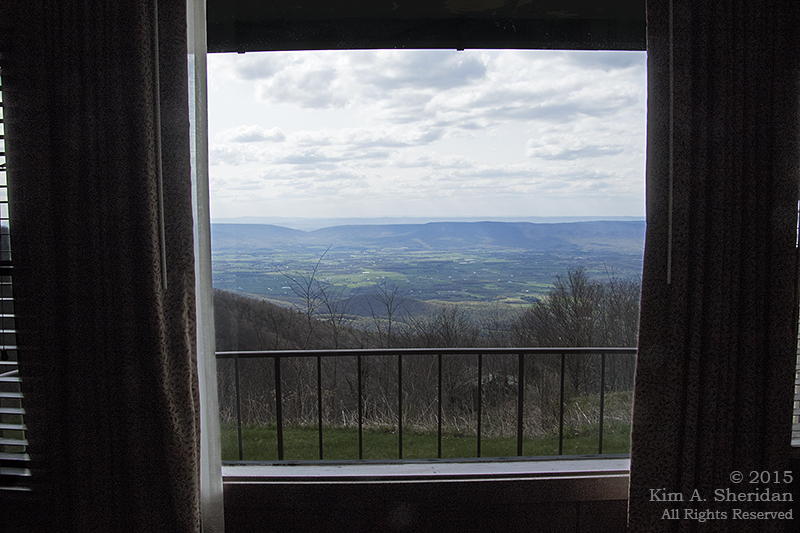 This is the view from my hotel room at Skyland Resort. Not too shabby, huh? …And the moon come out. With the dawn it was time to move on. A beautiful but bittersweet day, as I knew it was our last in the mountains, and we’d be home by nightfall. 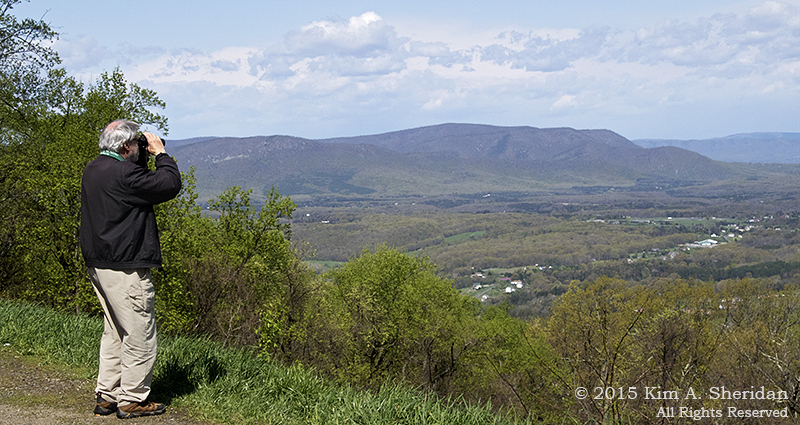 We spent the morning driving the remaining 40 miles of Skyline Drive to its northern terminus. 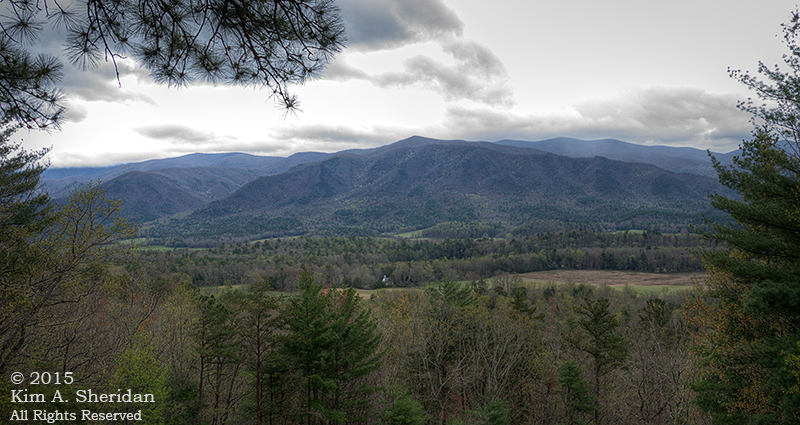 Looking along the Blue Ridge Mountains. 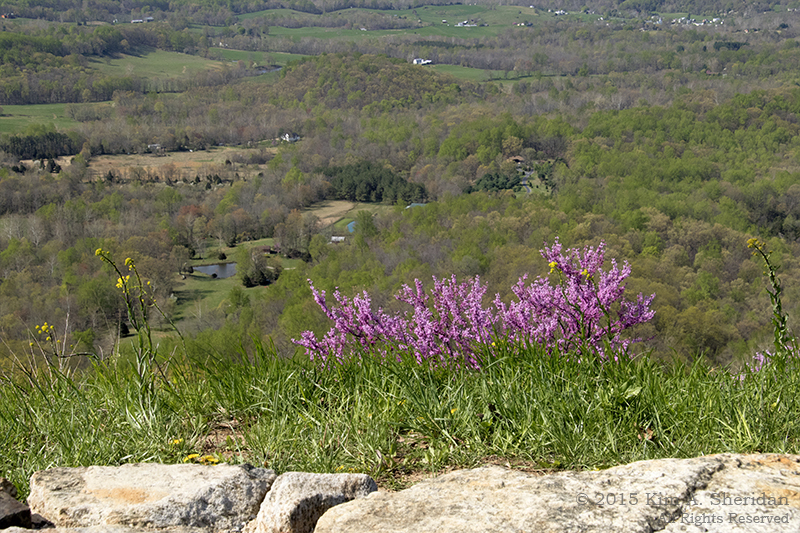 Old Rag, Mary’s Rock and Stony Man are all visible in this vista. 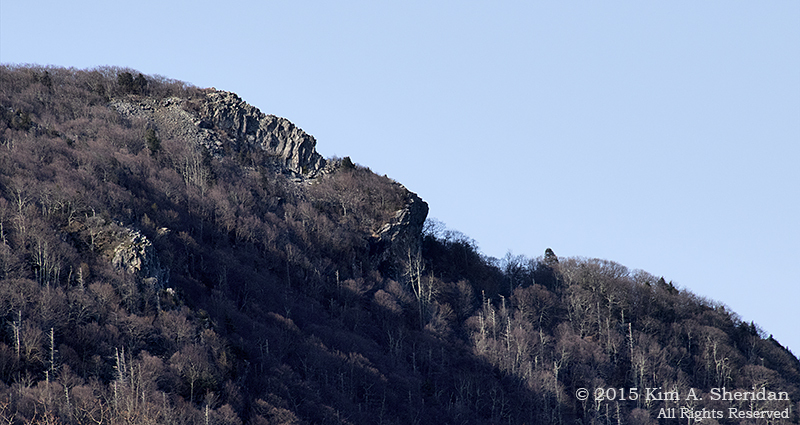 Can you find Stony Man? This might help. Here’s the famous Stony Man profile. 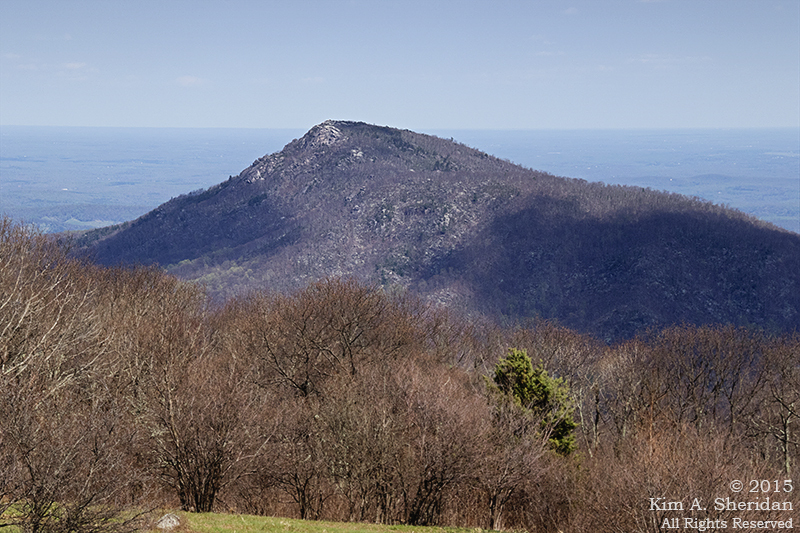 In April it’s easy to see the shape of the rock outcroppings that form the face. Here I am at Franklin Cliffs. More rock scrambling! At the very north tip of The Massanutten is Signal Knob, a high point used by Confederate troops in the Civil War to send signals. It was lost in the fog on our previous trip through the Park, and Don and I really hoped to get a peek at it this time. Signal Knob, at last. Don getting some much-delayed gratification. 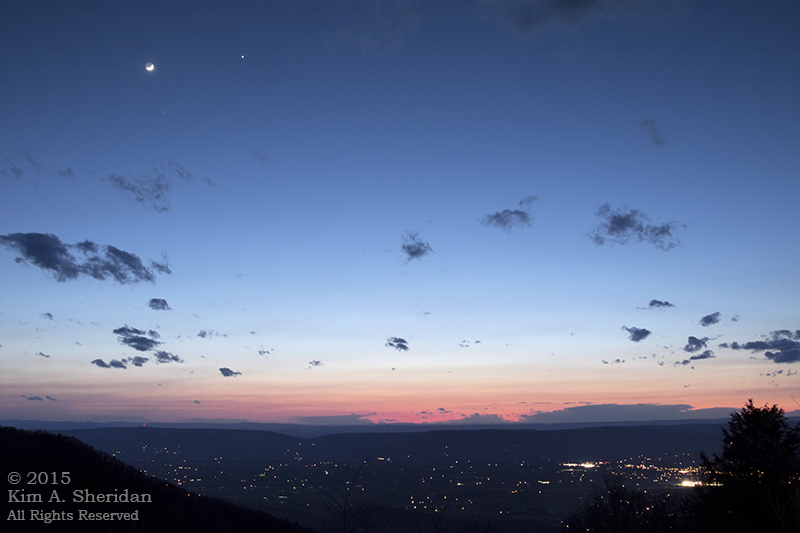 One last glimpse of the mountains and the Shenandoah Valley. Then it was time to leave the Appalachians for good and make our way home. Soon enough the skies darkened and the rain began. Two weeks is a long time to be on the road, living out of suitcases, eating fast food and sleeping in hotels. Don and I came home thoroughly exhausted. 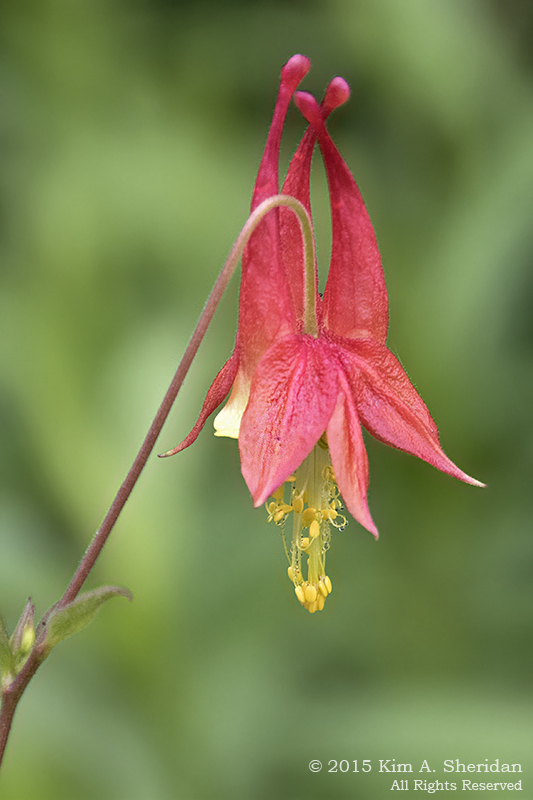 There were a lot of challenges, some uncooperative weather and not nearly enough bears. 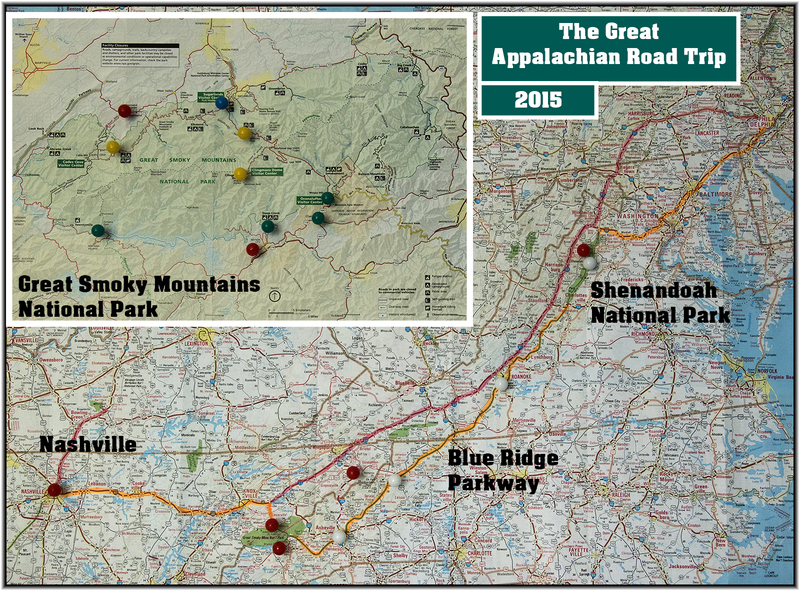 The Great Appalachian Odyssey of 2015 filled a shelf full of adventure tales for Don and me this April. Each day was like opening a brand-new book and not knowing what to expect. 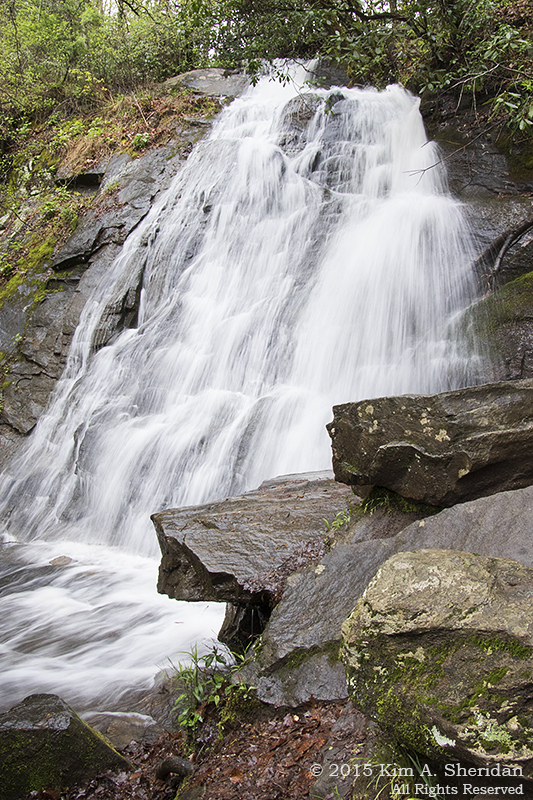 One day in Nashville, six days in Great Smoky Mountains National Park, four days on the Blue Ridge Parkway. 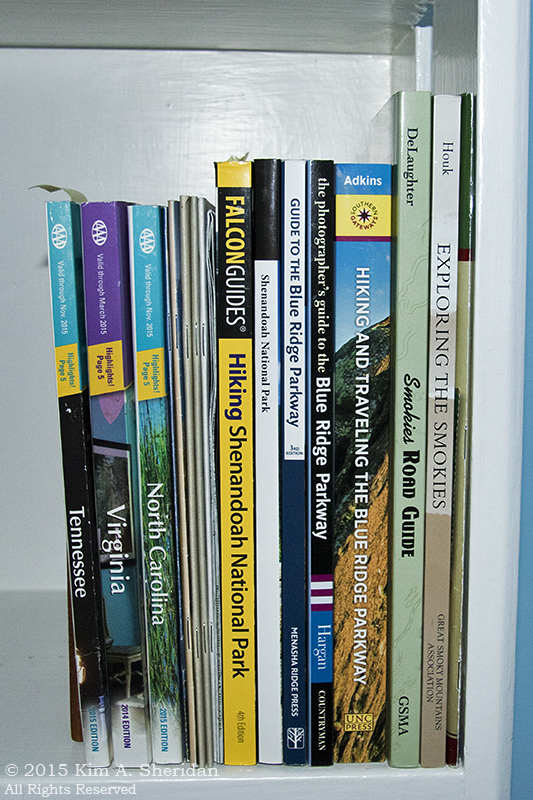 Shenandoah National Park played the role of bookends. We visited there on the drive down, and again on the drive back, spending two half days each time. The two visits could not have been more different. 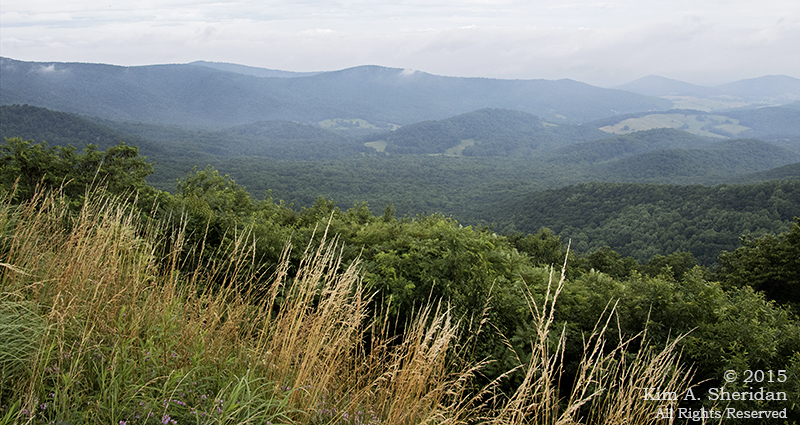 Shenandoah National Park is a long narrow park along the spine of the Blue Ridge Mountains in western Virginia. 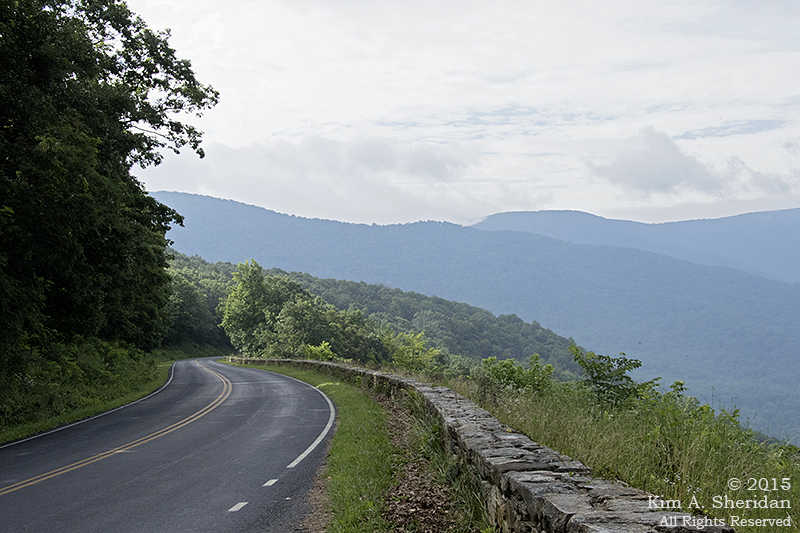 The highlight of the park is Skyline Drive, which runs the length of the Park along that spine, 105 miles from Front Royal to Rockfish, where it meets the northern terminus of the Blue Ridge Parkway. The road is a narrow two-lane byway that winds and twists along the edge of the mountains. 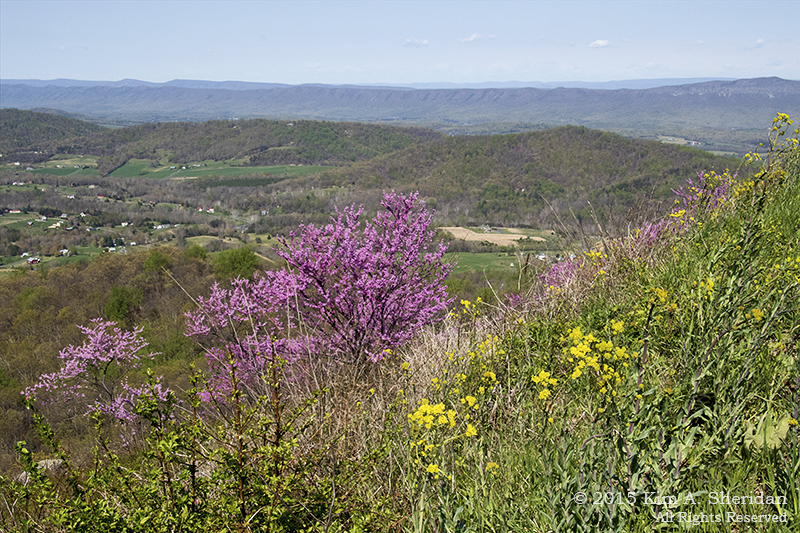 There are numerous scenic overlooks along the road from which to see the Shenandoah Valley and Massanutten Mountain on one side and the rolling hills of the Piedmont on the other. 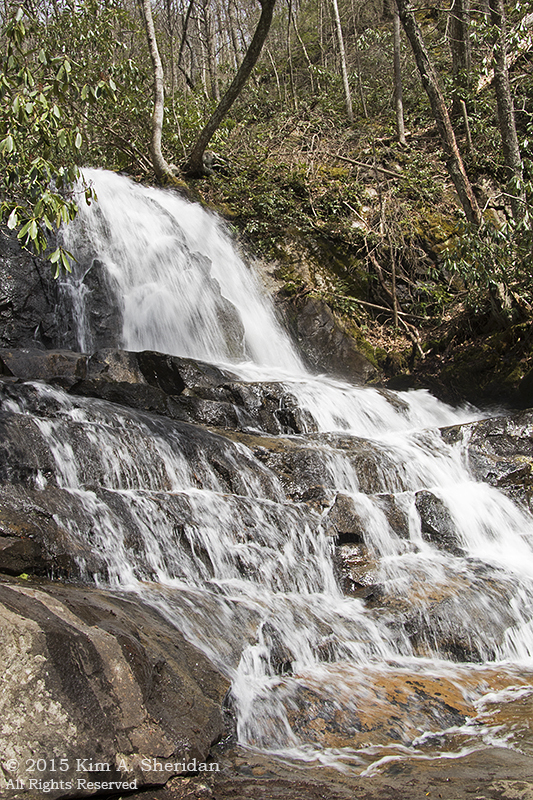 500 miles of hiking trails criss-cross the Park, leading to waterfalls, peaks and grand views. Don, Robb and I had planned a visit the previous Thanksgiving, but were thwarted by a heavy snowfall. So Don and I were getting a second chance. 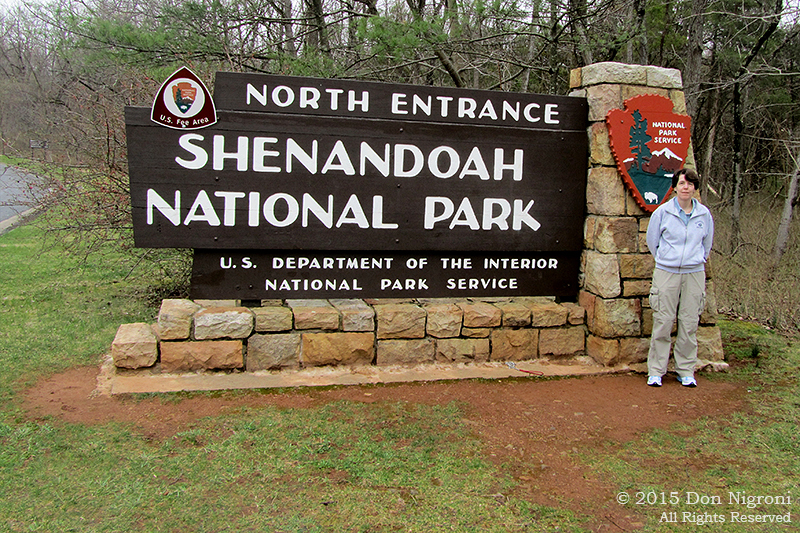 On the first day of our two-week trip, we arrived at the northern entrance of Shenandoah after nearly 7 hours on the road. Here’s the obligatory sign photo! Which was followed by the obligatory visitor’s center stop, in this case the visitor’s center and gift shop at Dickey Ridge. 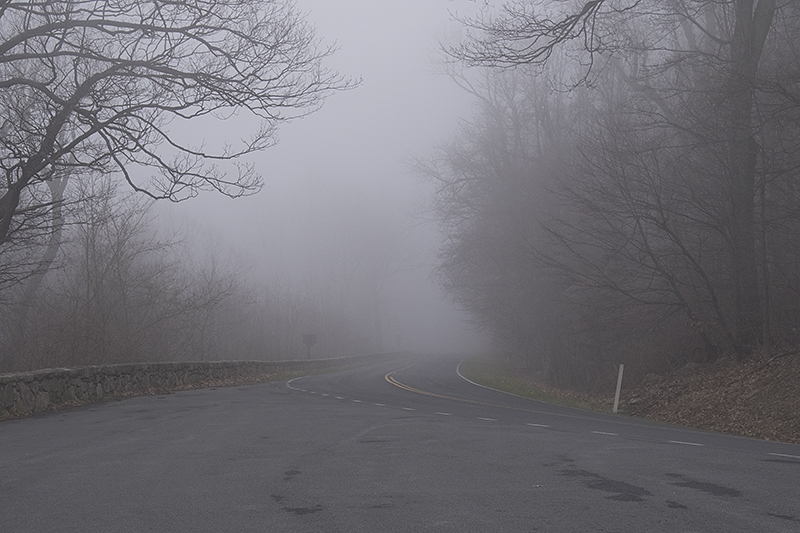 I was looking forward to driving the two-lane Skyline Drive after all those hours on the highway. Be careful what you wish for. 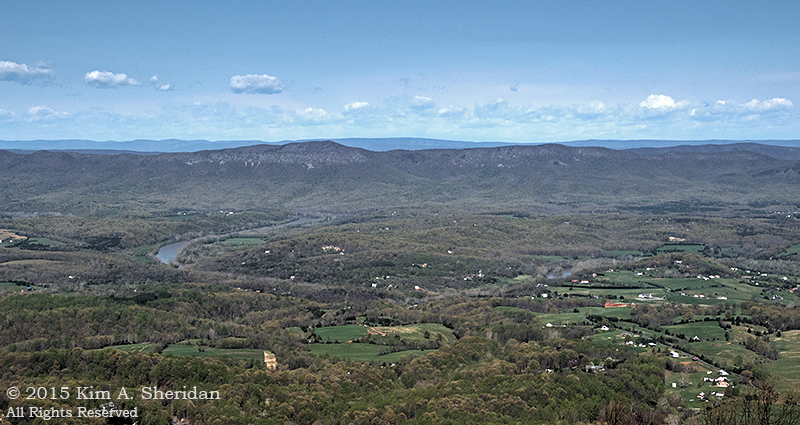 Not long after leaving Dickey Ridge we stopped at an overlook – I think it was Signal Knob – where I took my first photo from Shenandoah National Pak, with the Shenandoah Valley and River below. Clouds hung over the mountains beyond. 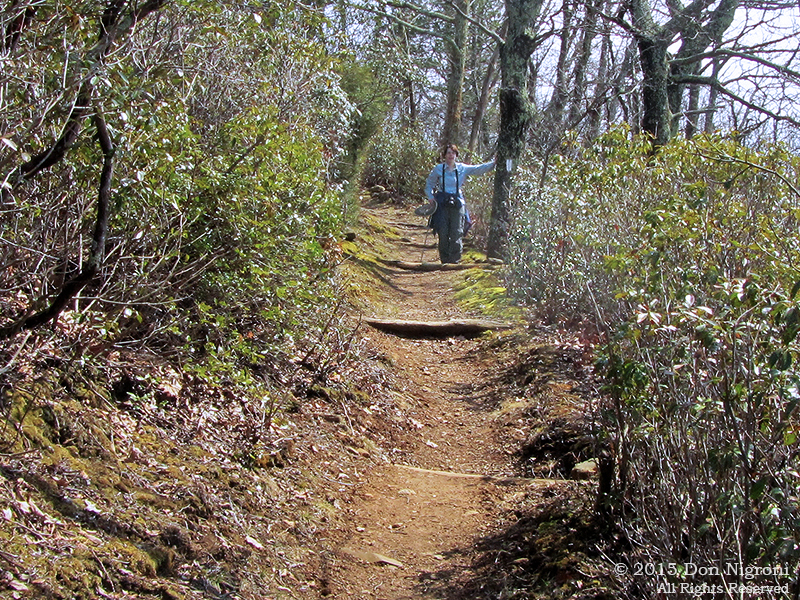 We tried in vain to spot Signal Knob on the northern tip of Massanutten. We also watched as the fog rolled in from both sides. 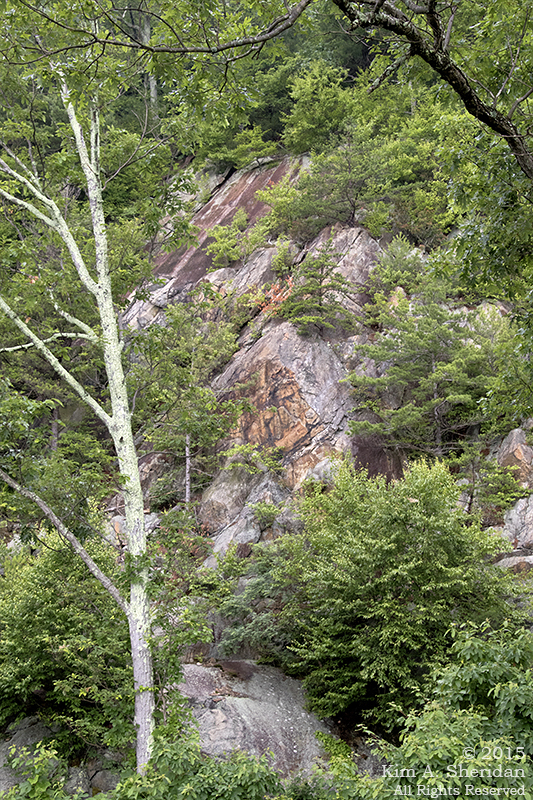 I gave up trying to photograph the view, and turned my attention to trees clinging to the rocky slopes. Don disappeared into the mist to investigate. The fog quickly grew so thick it swallowed the mountains, river, valley and even the trees and shrubs just beyond the roadside. It threatened to swallow my car as well. 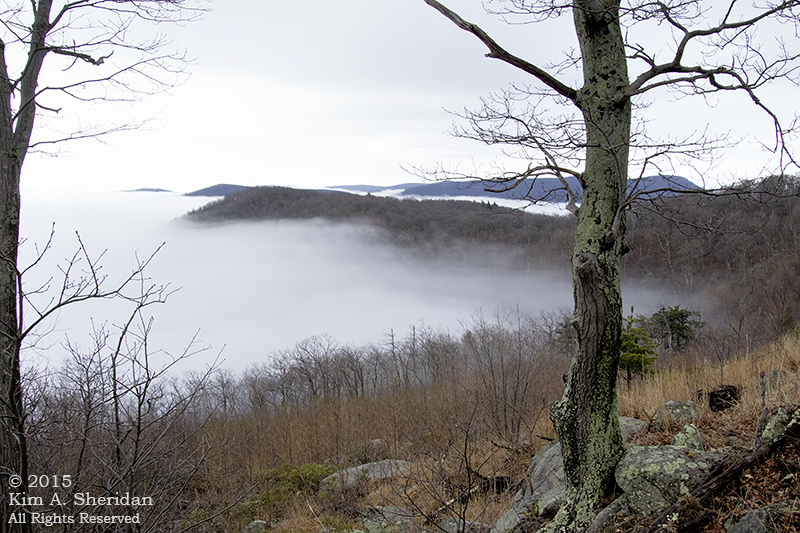 We saw no more of Shenandoah National Park that day. What followed was 25 miles of the most difficult driving I’ve ever experienced. 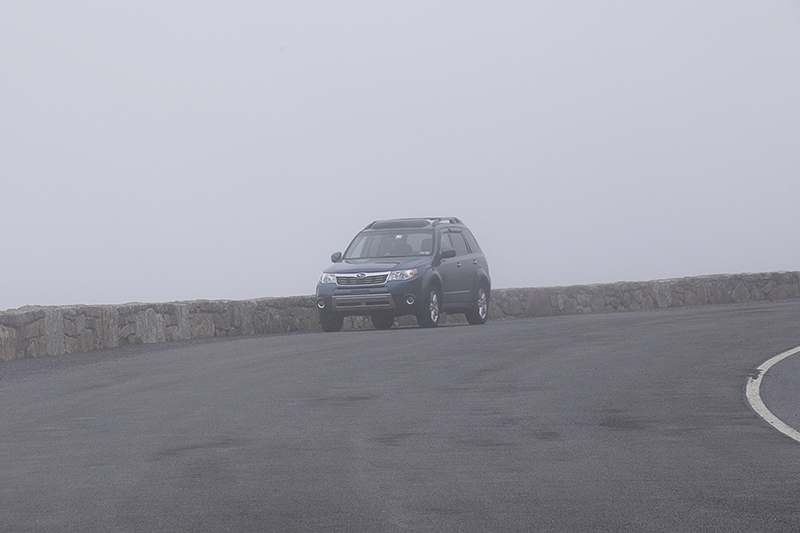 We made the decision to push south to the Thornton Gap entrance, hoping the fog would lift. We couldn’t see beyond the side of the road, even the rock overhangs; much of the time I couldn’t see the left side of the road. I could see ahead of me for maybe twenty feet. I drove the with my hazard blinkers on, following the yellow lines on the road and using my GPS to anticipate the frequent twisty curves. At one point a band of bicyclists materialized out of the clouds too close for comfort. 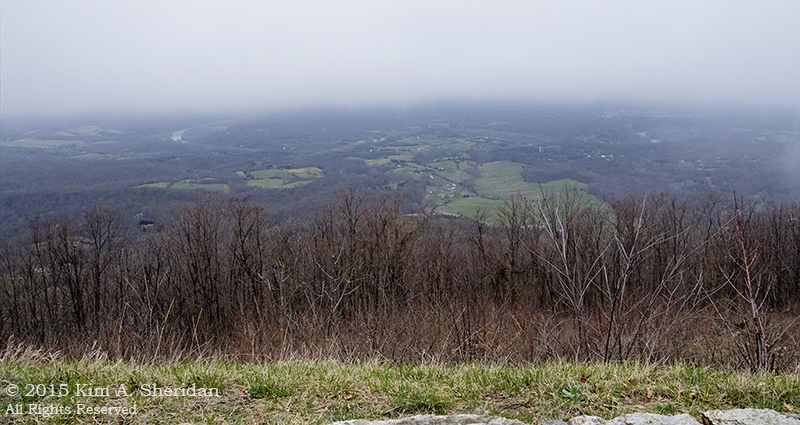 By the time we left the Park and descended out of the fog into Luray I was exhausted. Too exhausted to sleep that night. Not surprisingly, I wasn’t feeling well the next day, so Don declared a one-day layover in Luray to rest and recuperate. After a morning of me moping about, he found a cure for my malaise by suggesting we try Shenandoah again. 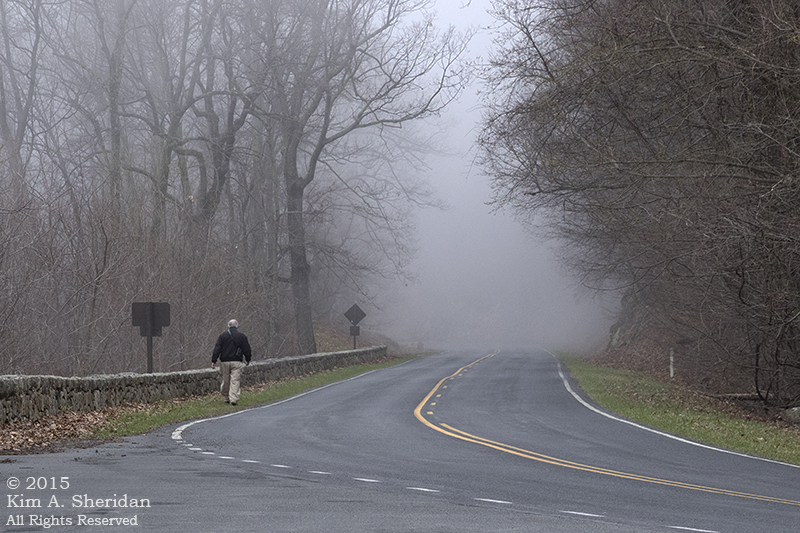 We entered at Thornton Gap and immediately ran into our old friend the fog at the entrance station. Don insisted we push south for a bit, and this time I’m glad he did. The gloom began to lift, my mood with it, and we pulled into an overlook. I took one look at the amazing sight of the tops of the mountains poking out of the cloud blanket below and forgot all my troubles. Photography time! Don on top of the world. It seemed like a perfect time for a little hike along the Appalachian Trail, my first AT segment outside of Pennsylvania. 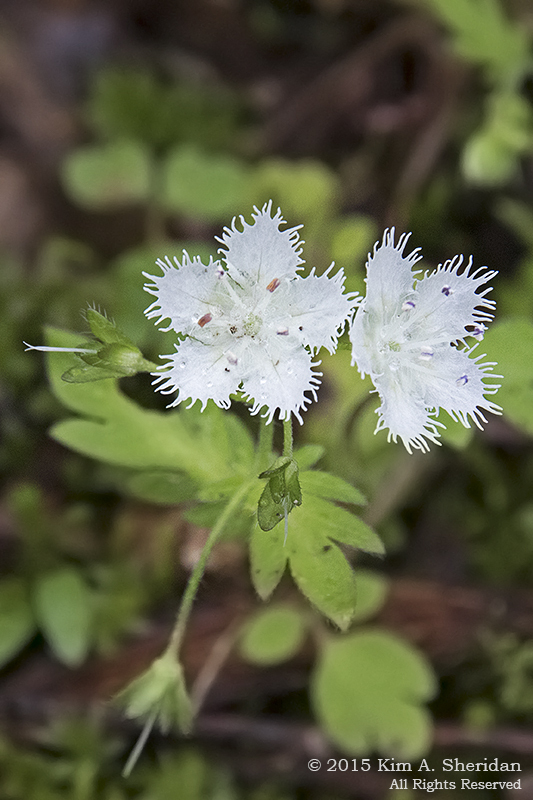 The white blazes mark the Trail. Above the clouds the sun was coming out. And suddenly it got warm! We enjoyed a close-up view of a groundhog, and posed for the only picture of both of us taken on the trip, Don trying to hide in the shadow of his hat. Our destination for the day was Skyland Resort. It has a lodge with a gift shop and two restaurants, and we were eager for a late lunch. While there, the clouds rolled back in. It wasn’t long before we were driving through the fog again on the way back to town, but by now I was an old hand. Driving through the Mary’s Rock Tunnel was dicey, though. 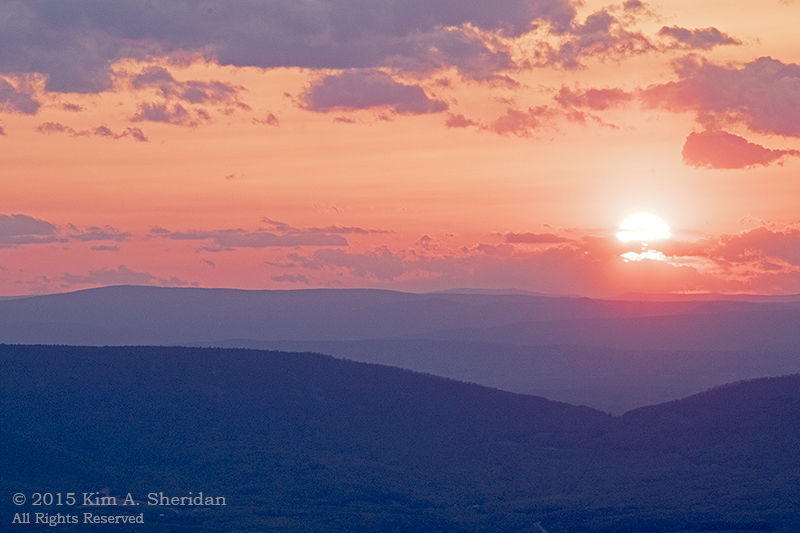 This would be the last we’d see of Shenandoah for awhile. 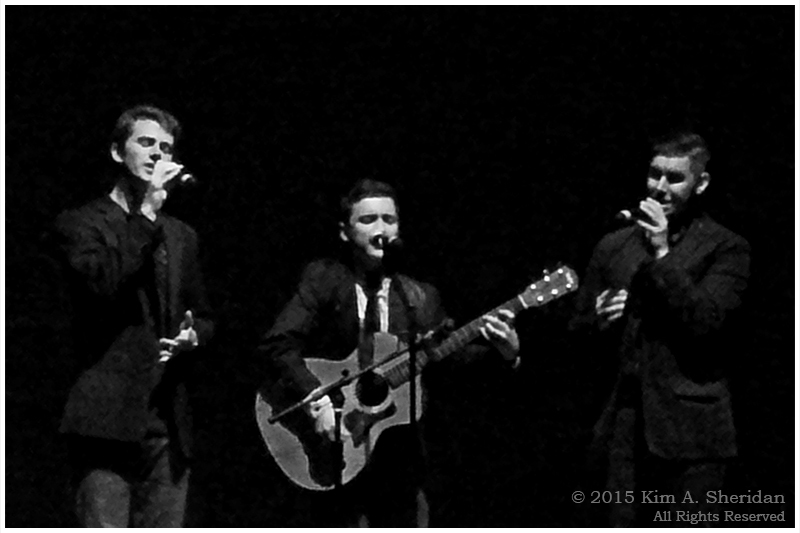 Nashville and the Smokies awaited!